Earlier in the week we received enough rain to get the rivers high. Some of the eastern rivers started to come down when another dose of rain fell and they went back up. For the upcoming weekend, I wanted to fish east, but with gas at $3.10 per gallon, my options were slim. The Grand was still too high, Conneaut was too far and the Chagrin was questionable. Both the Rocky and Vermilion were low and clear. Also, the Rock would be a zoo this weekend. Friday evening the Chagrin was coming down to the point that I knew it was fishable and I needed to tie goober sized sacs. I woke early and found the flow gauge was at 650cfs. That meant the river was a little high and dirty. When I arrived the river looked decent, but not great. I knew I was in for a tough day. I plugged away at several pools and worked the tailouts. For my efforts, I caught a couple of hens and that was it. For the entire time out, I didn’t see one person. On the way home it started to rain and through out the evening it rained off and on. I was concerned that the rain could blow the river out. I tied some sacs and if the Chagrin got blown out, I would have to the fish the (gulp) Rocky. I woke early Sunday morning and checked the flow gauge. The graph showed a slight hiccup and the Chagrin dropped to 550cfs. I geared up and started to walk through the woods. As I walked to the river in the dark, I could hear some rustling. I turned to see what it was and there was beaver feeding on a large tree. He froze when I shone the light on him. I wanted to get a picture but it was too dark. The beaver made a break for the water as I fumbled with the camera. I was surprised how fast he took off. 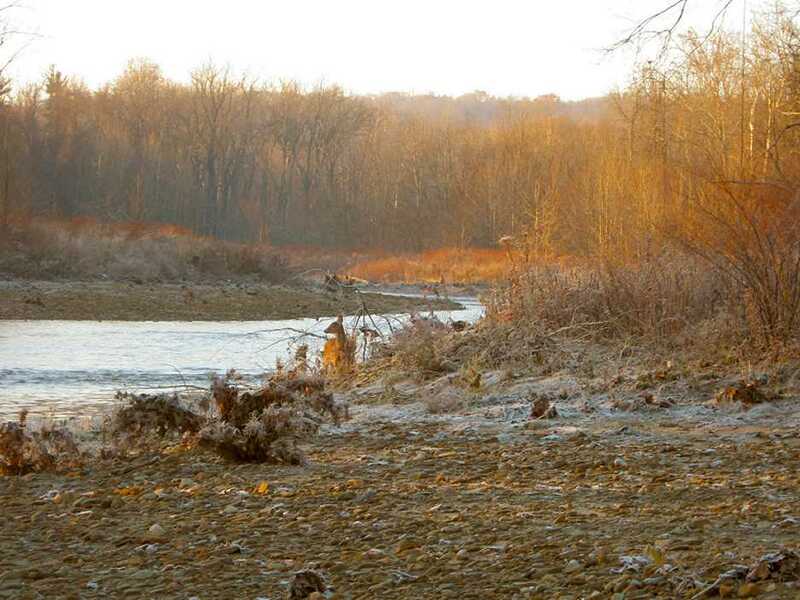 This section of the river runs through one of the many Cleveland’s Metro parks found in Cuyahoga County. It also runs through one of the wealthiest communities in Ohio. Many people don’t know how much urban wildlife there is. The Chagrin acts as a natural highway and many animals use it to get around. In this park, there are deer, turkey, beaver, coyotes and raccoons. There are also some animals that people hear, but don’t often see. One of them is the Great Horned owl. I was fortunate enough to hear one this morning. It was somewhat eerie hearing that owl call. By now it was first light and I tried to see where the bird was perched. I scanned along the treetops and I finally caught a glimpse of the owl. It was sitting at the top of a large sycamore calling out as I heard another owl in the distance. This is the time of year when horned owls start looking for a mate. I continued walking and startled another beaver feeding along the bank. He bolted for the water in a hurry. What is unusual with these beavers is they don’t construct lodges, instead they live in the river’s banks. Today, the river was in better condition. I fished the same spots and the results were better. All of the fish caught came from the tail end of pool and along the edges of the main current. It was a mix bag of fresh and older fish. 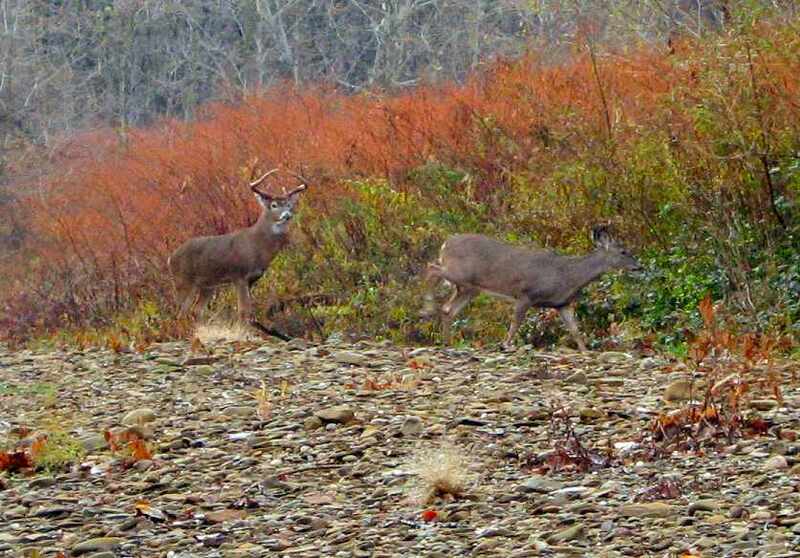 As I was fishing, I noticed a large buck and doe emerge from the woods. 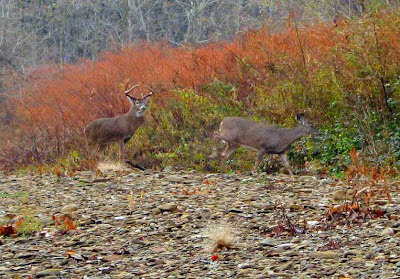 As with the owls, deer are mating and this large buck was courting the doe. In this area, deer tend to be more use to people and they stood there watching me. I got the camera and used the zoom to get a shot. During that morning, I saw about 10 deer. The bite shut off around 11:00A.M and I decided to hit another spot farther downstream. The fishing was slow and I talked to a couple of anglers that caught a couple here and there. 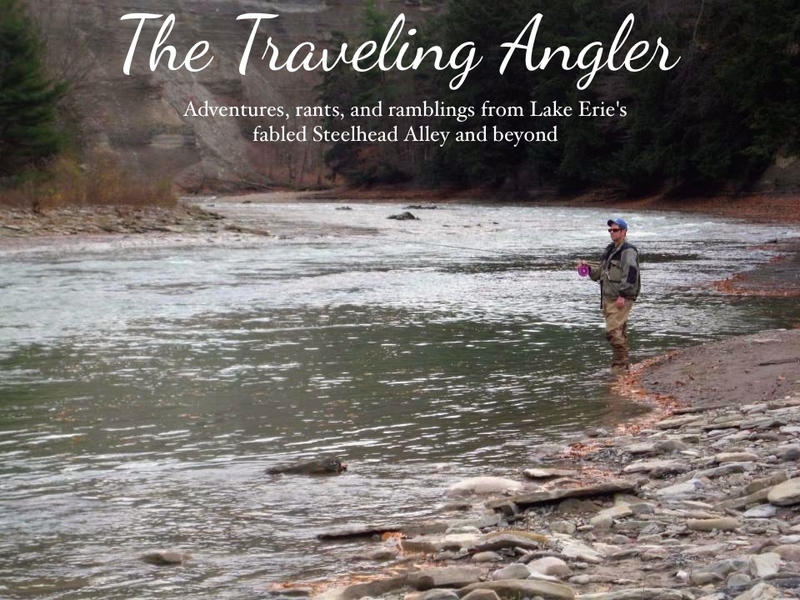 I agreed with them the fishing on the Chagrin was average. It was like that last fall as the fish really didn’t come in until spring. I managed to catch a couple more and my back started to ache. It was about 12:30P.M and I decided to head home to watch the Browns and Ravens. Once again the Browns made the game interesting and I thought they lost the game when Phil Dawson missed the tying field goal to force overtime. The ball clanged off the bar and hit the crossbar, then bounced back onto the field. I was disgusted with the poor effort from the team and changed the channel. During commercial I switched back to CBS and noticed the game was still on. I was puzzled and found out that the officials reversed the call as the ball hit the crossbar extension. By doing that, the ball broke the plane, therefore it was good. The Browns won the toss and marched down field to set up the winning field goal. Dawson’s kick was good and I wished I could see the look on Art Modell’s face. These Browns make the Kardiac Kids look flat line. I'll be taking Turkey day off for some much needed sleep. Next week, I'll be cashing in my vacation time. That week is also deer hunting season. A lot of guys will be hunting instead of fishing. Memo to self - find orange toque. I look forward to spending more time over your way Greg. You guys are fortunate for a great Parks System!